Vacation rental house. Sleeps 9, 3.5 bedrooms, 2 bathrooms. No pets allowed. Beautifully landscape grounds add to the overall charm of this property. Kitchen opens directly to the dining area. Lots of natural light. Great Open Living Space. Lots of windows allow in natural light that adds to the warm and roomy feel. Cozy up on the comfy furnishings that look out onto the gorgeous views beyond. Enjoy the wood burning stove on those cozy winter evenings. 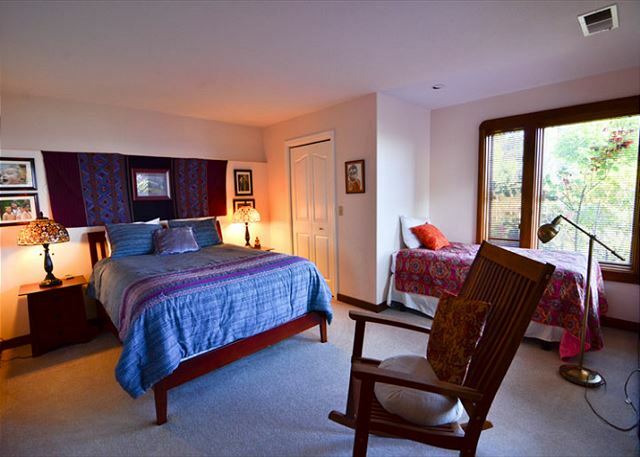 This bedroom boasts high ceilings, lots of natural light as well as spacious layout. Spacious bathroom with well lit vanity. The trundle bed in this room offers additional sleeping space for larger groups but can also be stored below the day bed when not in use. Tall windows in the bedroom provide lots of natural light when needed but curtains can be drawn to dim the space and provide more privacy. Open sun room area has been converted to a bedroom. Garden views, curtains and /or privacy screens available for privacy. Warm and eclectic decor and comfy bedding make this bedroom a great place to cozy up. This spacious bedroom contains both a queen size and a twin size bed. Twin bed comes with a nice view too. Half Bedroom with Bunk beds help provide enough sleeping space for the entire family and can make for a very fun stay for the children. Large bathroom with stand alone shower and well lit vanity. Fire up the grill and revel in the beauty of redwood coast. Take in the seascape from the private lookout point. Expansive south and west-facing ocean views. Enjoy the majestic views while preparing meals in the fully equipped kitchen including a gas range. Two minutes and two miles to Trinidad markets and restaurants, one minute off freeway but an oceanic soundscape. Five to ten minute drive to expansive beaches, parks, lagoons, hiking trails, and secluded coves, and 30 minutes to Prairie Creek State and National Redwood Park. A truly international house belonging to a family of explorers, featuring folk art collected the world over and photographs from trips to remote corners of the earth. A one-of-a-kind treasure -- warm, cozy and inviting with a bird's eye view of infinite horizons. Rent is based on 4 people. Additional guests will be charged $20/night per person. Please be accurate when booking and call us to add any additional people if plans change after booking! This was a business trip for three professionals who get along very well and wanted to stay in a single place that allowed for home cooking and some serious privacy. The entire experience was well beyond our expectations, and we are coming back for two additional stays over the next for months. Thank you for your recent stay and we are pleased that the Alegria Del mar was a good fit for you and your colleagues. We look forward to your return and hope your future stays will be just as wonderful. This place is perfect. Its clean and cozy and has spectacular views! It is not handicapped accessible from the front porch (3 to 4 stairs to the door) however, it's still a beautiful home. Thank you for taking the time to review the Alegria Del Mar. What a perfect home for a small reunion. The views from the dining room and rear are spectacular and the home is spacious for a small group, although some of the rooms are ideally for children. I am glad to hear this home was a good fit for you, and I do hope you will return again for many other reunions to come. Beautiful views! Plenty of space for family. Big kitchen. About 2 miles to Trinidad town for groceries and fishing charter boat. Both the property manager and the owner took great care of us! Thank you for your recent stay at the Alegria Del Mar. It was a pleasure meeting you all and so glad you enjoyed your time here. I do hope you will return to visit us again in this home, or any one of our other homes. Two nice bedrooms with 4 more beds shoehorned into what was once one lower bedroom. We were a party of 5 and I thought that Max capacity unless you had 4 young children for the cramped lower room. Actual Address was ___ Place but the Company representing the home provided ___ loop and ___ Rd instead, making locating the home difficult. They seemed oblivious when it was brought to their attention. Main bathroom toilet backed up on the 2nd day of our 2 day stay. Thanks for your review. We got the address straight. Thanks for bring that to our attention as this problem has never occured before and glad we were able to fix it so there isn't any confusion for future guests. We do provide accurate photos and description of the bed layout. sorry you were disappointed in that but otherwise I feel like you had a nice vacation in Humboldt and the Trinidad area. Thanks for choosing Redwood coast Vacation Rentals and hope we can find a home that may fit your needs better! Alegria Del Mar was a fabulous stop on our way around Northern California. The home was well appointed, clean, with plenty of space for our party and lots of fluffy white towels! The grounds were beautiful with perennials and plants in abundance. Had a fabulous sunset view. Kitchen table was perfect for eating in and game night. Two sinks made clean up a breeze and the addition of the dishwasher helped. Note: We were hoping that we would somehow be able to walk to the beach from here. You can't. The home is on a cliff and you can't get to the Scenic Drive unless you drive. Not an issue for us, but thought I'd mention. It's a short drive and worth it to take a trip down to the beautiful beaches of Trinidad. Thanks for the great review and the mention that there is no beach access directly from the house.. Moonstone beach is mere minutes away. It's a great spot for surfing and kids! Our group was very satisfied with the house. It's a great house with spectacular ocean views. Hope We can host gain! The Alegria del Mar Ocean Views house was a perfect stay for our Chicago family to visit. The house is equipped with everything travelers need to enjoy a home away from home, including a dishwasher! (This must have been recently added.) We went ocean fishing at Trinidad our first day and caught more than enough fish to cook for several meals. Our favorite parts of the home were the downstairs walkout to the quaint patio and the glider chair facing the corner of windows, overlooking the ocean. We didn't notice the binoculars until our last day--bummer! Because we had two young kids, we appreciated the small bucket of toys and books. The house binder outlines everything visitors need to know about the home, including local attractions and restaurants. The house is beautifully decorated, creating a comfortable atmosphere. Something that may be of importance to visitors is that one of the bedrooms (two twins) is more like an alcove with a curtain used for privacy. This wasn't a problem for our family but may be for others who are expecting four private bedrooms. The location is private and secluded. While there are a few neighbors, the layout and landscaping of the proper creates a feeling that no one else is around. While the location is in Trinidad, it is not necessarily near the town so visitors must drive to town, restaurants, beaches, etc... Overall, we loved our stay! Thanks for the great review and for choosing Redwood Coast Vacation Rentals. The home and area is just a s described and hope you can visit with us again! This is an absolutely amazing place. After the first day we wished we had planned for more days here. The view down the coast was visual therapy, the gardens and landscaping were beautiful and the hummingbirds were constant entertainment. The house is gorgeous with high-end woodwork and furniture throughout. The kitchen was well laid out and easy to use. We really hope to be back someday. Fantastic! Thank you for choosing Redwood Coast Vacation Rentals. The house was fantastic with views of the ocean that couldn’t be beat. Most of our planned activities were within a 15 to 30 minute drive of the house location which was also perfect. The house was stocked with everything we needed and more for daily activities and cooking. My only recommendation is to have screens available on all windows so guests can open windows in the living room and lower level without bugs and critters being able to come in. Excellent review! Glad we made some great memories for your family! I will take a look at screens. Fortunately we don't have any real bug issues in Trinidad. The house was beautiful, comfortable, and well-stocked. The views were mesmerizing. The photos don't really do it justice. We absolutely loved it. Loved everything about this home. It felt comfortable and had incredible views over Clam Beach. Quiet neighborhood. Kitchen was well stocked. Enjoyed a casual beer and burger at Papa Wheelie's in McKinleyville. Thanks you for the great review! Hope we can host again! We spent two nights in this lovely home with two adult kids and two grandchildren. The home was better than the pictures convey and I'd love to stay here again. Thanks for the great review! We certainly expect you to come stay at the Algeria Del Mar anytime you wish with Redwood Coast Vacation Rentals. Second time visiting this time brought the family great time had by all only thing that was missing is a dishwasher and cable for the tv but will back next year! Thanks, Wane! Dishwasher and Cable (there is smart tv!) aside we are very pleased the hear that you will be coming back next year and hope that you can bring the rest of the family again! Trinidad and all of Humboldt County is fantastic and there is always something new to see and enjoy! Looking forward to your next stay with us @ Redwood Coast Vacation Rentals where we have over 100 affordable vacation homes in the area! This is the second year that we have rented this home and I love the views, the decor and comfort of this house. Samantha is very professional as was the rest of the staff at RCVR. I would definitely recommend this house to a friend. Thanks, Kari! Can't wait for your visit next year! Quiet location away from the local hubbub, and a million dollar view of the southern beach. Lovely landscaping provides several spots for quiet contemplation while watching the waves roll in and light play with the evergreens. The home itself is perfect. 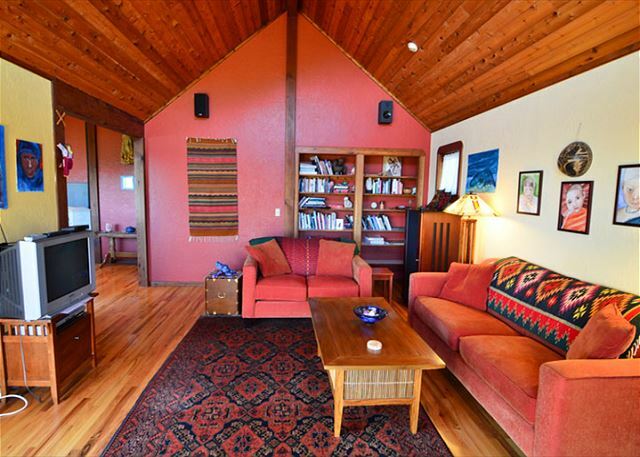 Well furnished, comfortable, easily heated with a woodstove or cooled with open windows. Loved it, will be on the top of my list next time we come to the Redwood National and State Forests. Thanks for the great review! Looking forward to hosting again at the Alegria Del Mar or any of our 100+ affordable vacation homes here on the North coast! Thanks for the nice review and hope we can host again! It does need a deep clean in the corners. The seat cushions on the dining chairs need replacing. The coffee pot leaked water onto counter. I contacted you about it after we left. Hi Eileen! thanks for that feedback! We have replaced the coffee and scheduled that clean. Fall season is here and time for that after summer cleaning! Algeria is a great place and so glad you had a great time and hope we can host again! Trinidad rental, ocean views galore! Great location, quiet and your own park-like grounds. Could use a little machete work to open up the view from the Adirondack chairs. Recommend paper plates since there is no dishwasher, and I forgot to bring him on this trip!! Thanks for the great review for the fabulous property! Hope to see you again in the future here or at any of our 100+ properties with Redwood Coast Vacation Rentals! We had a gathering of seven of our family members, including two girls ages 11-13 and two seniors ages 74-79. The house was beautiful and perfect for our needs: a great kitchen, beautiful living areas, plenty of very comfortable beds, and two large baths. The pictures don't reveal how stunning the gardens are, and we all spend a lot of time in the garden watching the many hummingbirds, looking out over the coast and tracking the tides, star gazing. Everything that we cared about was convenient from the perfect beach 2 minutes away to the redwood forests and all the amenities in the little towns of McKinleyville and Trinidad. The property was pristine and decor is beautiful. We were surrounded by interesting and elegant art in every room. The owner and Redwood Coast Vacations were easy to work with, helped as needed with rental arrangements, and provided a great ap for easy access to all the information that we needed about the house and the area. We wanted to stay longer and pledged to come back...this is how we imagine a little piece of paradise. Oh My Gosh what an excellent review! I don't have anything to add...you have said it all! See you next year! Thanks again for a wonderfully relaxing family vacation for my parents, my family and my brother's family! Your Oceanside home was beautiful, spacious and clean and we thoroughly enjoyed ourselves. Thanks for the nice review! We have over 100 homes with Redwood Coast Vacation Rentals! Something for everyone! This home is extremely cozy and comfortable with incredible views. Tranquil and peaceful, and all the amenities one would expect, plus close to town. Thanks for the nice review! Alegria Del Mar is a special spot with us at the vacation rentals. We hope you can return someday with Redwood Coast Vacation Rentals ! We have over 100 vacation homes to choose from! The house was comfortable; the views amazing. Will be back! Thanks and! we expect you soon and thank you for choosing Redwood Coast Vacation Rentals! Great house for the extended stay with family & friends. Nicely equipped for the week or the weekend. Thanks for enjoying Alegria! It really is a nice spot with fabulous ocean views. Hope we can see you and your family again in the future with Redwood Coast Vacation Rentals! Even though most of the flowers were finished for the season and we had torrential rain for 3 days, our stay at Alegria del Mar was comfortable, enjoyable and we had a ball. More closet space would have been nice but the furniture was clean and cozy and the kitchen was well stocked with appliances. Thanks, Katherine! The deluge of water from the sky hit us all by surprise and was most exciting! We are glad we were able to provide a comfortable home for you during your stay. Coincidentally, I was just doing a walk through and was thinking to myself it's time for the owner to clean out and open some closets, especially in the upstairs bedroom. Thanks for that feedback as I entirely agree. We hope we can be your annual destination for your girlfriend trip! We do have families that come here every year! Since the first time I saw a picture of someone driving a car through a tree in my 8th grade Geography class, I knew I had to do it! Forty years later my sister, brother-in-law, husband and I finally make the trip from Ohio. We spent five days in the Alegria del Mar house located above the Pacific coast. The house was perfectly located on the ocean and close to the National Redwood Forrest Park. The house was homey and comfortable to come home to after a full day of exploring the Forrest, Agate Beach, Clam Beach and the cities of Trinidad and Arcada. It was so calming and peaceful to wake up to see the waves on Clam Beach. The house was clean and accommodating. I would book it again if I'm ever lucky enough to go back to Trinidad. Great Marge! We hope you can mosey your way out here again! The owner originally comes from Ohio. He is very pleased you had a nice time. thank you for choosing Redwood Coast Vacation Rentals! Thanks, Pam!! We really would love for you to visit us again with Redwood Coast Vacation Rentals! Trinidad and surrounding area is a great place to visit, get some relief from the hot weather in the valley, and enjoy some local fab food and products! We had a nice time just hanging around the house. It was so quiet, perfect for a good night's sleep. Thanks for the great review and hope you can return again to the Alegria Del Mar with Redwood Coast Vacation Rentals! Family of three spent 4 days there as a base of exploration to Redwoods. Comfortable, very clean, uncluttered home. Spectacular view. Quiet though close to Hwy 101. Inviting 'artist's' garden with chairs and table. Beach or quaint community with amenities 5 min away; 20-30 min to Redwoods NP and Arcata. Would be cramped with more than 5-6 people. Thanks for the great review and mentioning what a great time you had during your stay at the Alegria del Mar! Thank you for choosing Redwood Coast Vacation Rentals and hope you will stay with us again! We really would like you to return and enjoy Redwood Coast Vacation Rentals again! We love our happy guests! My family very much enjoyed this quiet, well decorated home near unique national parklands and Pacific beaches. Having a house situated in Trinidad is great to have. The travel time to both northern and southern Humboldt makes it reasonable. Also, you are only a few exits away from Clam Beach and Patrick's Point. Also, the neighborhood is quiet and there is enough parking at the house. The views are incredible and the ambience in the house is welcoming. The house is close to the nearest grocery store (Trinidad or McKinnleyville) which makes it possible to buy things you happen to have forgotten before your travels. The house is extremely clean and offers a washer and dryer for those days that you decide to go jet boat touring and/or have taken a long hike that you come back drenched from sweat. 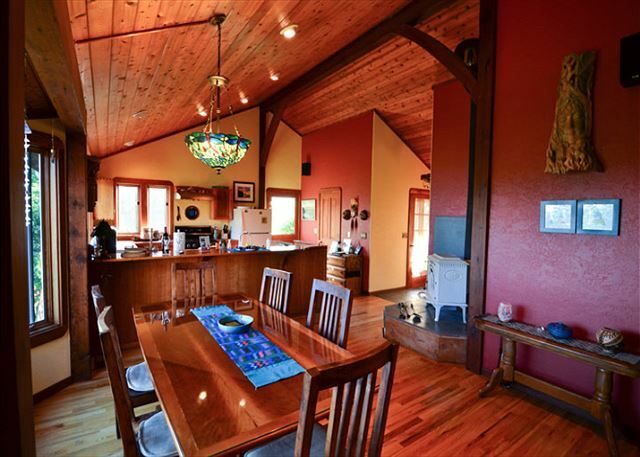 The service from a redwoods Coast Vacation Rental is as great as the homes they provide. They are quick to respond to question and are very helpful if you have a concern. I would definitely use Redwood Coast Vacation Rentals and may use this house again in the future. Thanks for the great review! We love Alegria and the views are tremendous. We hope you come again! Thank you for choosing Redwood Coast Vacation Rentals! The house was very nice. We had a beautiful garden and ocean view. The kitchen was nice, coffee was available. We found everything we needed. Thanks, Jose! Alegria Del Mar is a great place for all to enjoy. We hope you come stay with us again here with Redwood Coast Vacation Rentals! The place was perfect for our multi age group. Comfortable with most amenities anyone needs. Beautiful view, quiet and relaxing. Need TV channels and sharpen kitchen knives. Thanks, Diane! So glad you had a successful graduation and the house suited your needs. we appreciate great feedback and we will certainly take care of those knives. We have a smart TV at Alegria for Netflix and other streaming channels, only, plus a few channels that come in with the digital antennae. Thanks, Cheryl! Hope to see you again and thanks for choosing Redwood Coast Vacation Rentals. From the time we arrived to the time we left it was top notch! Thanks Wane! We hope you come stay with us again! Wonderful place to get together. Lovely decor, helpful handyman, and the views of the ocean made it special. No problems with the house or appliances. Great review and thank you! The owner is awesome, too! Thank you for choosing Redwood Coast Vacation Rentals! We had a group of 9 women from my family come stay at this wonderful retreat. The view is beyond what the pictures show. We loved that there were many twin beds around the house. We were very comfortable in this home. We cooked all of our meals at the house and the kitchen was well equipped. The price was very reasonable for how many it accommodates. We are already planning our trip for next year! We plan on seeing you next year, then! So glad you had such a nice time and found it accommodating. We were 3 adult guests and were very comfortable in this house. We did not use any of the sound equipment or TV, so we can't speak to how that functions. The beds were comfortable, everything was clean (with the exception of the blinds). The kitchen was adequate for our modest needs. The interior of the house is spacious, with wonderful touches of redwood and cherry wood and gorgeous lamps - tiffany, a star lamp, etc. The view of the coast to the south is spectacular. Sunsets at Moonstone Beach nearby are gorgeous. 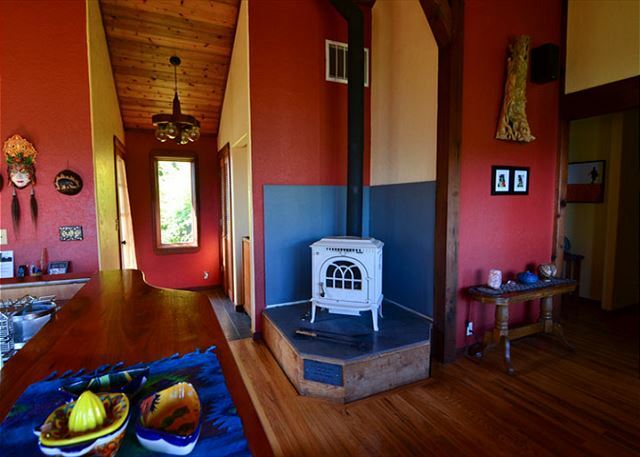 The wood stove is wonderful and kept us cozy in the chilly autumn weather. We really enjoyed our stay and it met all of our expectations. It was just my husband and myself, and we really enjoyed the house and grounds. The veiw is amazing and we really enjoyed the outdoor gas grill for cooking. I have traveled all over the world and would recommend this property. It is a great place to stay if you want to be close to the National Park for day hikes. I had considered staying in Eureka and was so glad I chose this house instead. We are glad you chose Alegria del mar, too! It's a great home and the owner is a world traveller himself. Please return to this home on your next trip to the redwoods, and if it's not available we have over 70 homes to choose from; virtually something for everyone! Thank you again! Beautiful relaxing home and location. Spent three days in paradise with 10 family members. Traveled to the coast for a family wedding. This was the perfect place to spend time together before and after the event. Moonstone Beach was perfect for the children to play and adults to relax. We are already talking about our next trip as we made some great memories. Thank you so much for having a great time with fantastic memories! Alegria Del Mar is a wonderful home to make those memories in and hope we see you and your family here again to make some more! The view from the dining room and kitchen window is breathtaking. You can hear the ocean if you open the windows in the kitchen. There is a perfect spot for relaxing and sitting quietly while looking at the ocean. Thanks for having such a a wonderful time at Alegria del Mar with Redwood Coast Vacation Rentals. We appreciate great guests such as yours elf that can recognize and enjoy their surroundings. Please come again any time! We loved the house, garden, view and everything else. We hope to be back. We expect you to return! Alegria sits on the bluff over the pacific and with amazing views of the ocean and surroundings! 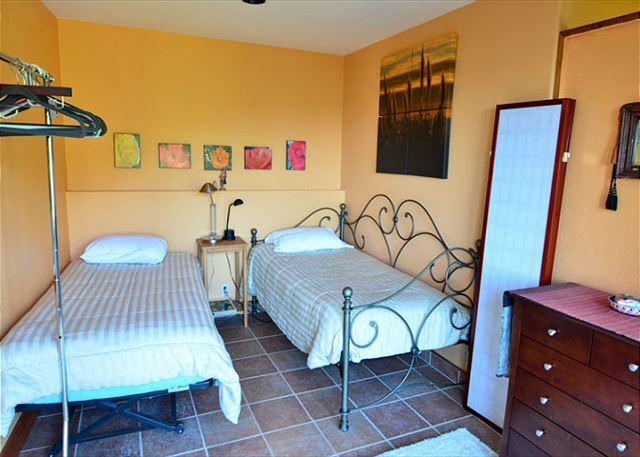 I decided on Alegria del Mar for several reasons: the location, the size, and the amenity of washer and dryer. We had a large group for our destination wedding and needed the space and two floors to ensure that the bride and groom are able to get ready separately before the ceremony. It worked out perfectly! The top floor, entrance, has one bedroom and a bathroom, and the bottom gloor, has the additional bedrooms and bathroom. The view from the house on either floors were to die for and I am sure made out some great photos and footage in the getting ready time. The kitchen is huge and has all of the amenities needed to feel like your home away from home. The artwork and aesthetics of the house inspires one to travel the world. I love the personal touches the owners left to share with us. The garden is beautiful. Parking is also ample. You will not be disappointed when renting Alegria del Mar. Thank you for a memorable wedding getaway. This is a great home for a lot of reason. We hope you visit Humboldt again somedauy! We have over 70 properties through out the region, so we will always have the right property for everyone! We had a wonderful experience. A beautiful house with a lot of personal touches. A gorgeous garden and beautiful views. We drove up the coast and would strongly recommend visiting the Fern Canyon. Fern Canyon is one of my favorite spots. too. I always recommend it first for easy hiking with amazing scenery! Just as Alegria Del mar with Redwood Coast Vacation Rentals is amazing! Please come again! What an amazing space...we had a wonderful time. Great kitchen, amazing garden, and great view. The house has a terrific collection of art and books and interesting pieces. Wish we could have stayed much longer. We want you to return to Alegria anytime! Thanks for such a great review! Redwood Coast Vacation Rentals has plenty to offer everyone at one of our 70+ properties here in Redwood Country! Alegria is a great place for family! We chose Trinidad as our home base for our Redwoods vacation. It was an ideal location to hit the state parks, the beaches and all Northern California has to offer. The house was just right for 2 adults and 2 kids (17 & 10). It was comfortable, clean and had a beautiful view. We saw whales and their babies migrating north one morning. We'd stay there again! My only wish was that it had a dish washer. We like to eat in when we vacation and I missed a dishwasher! We loved this house! We were visiting for our son's graduation from HSU and had a great time. I would caution others-there are really only two bedrooms in this house. Then there are two twin beds behind one curtain and bunk beds behind another curtain. If you use these "rooms" a clothes rack on wheels is provided. We only needed the two real (and lovely) bedrooms during our stay, but I would have been extremely disappointed if we had needed the other beds. This should be advertised as a two bedroom house with extra sleeping space. Otherwise-fantastic!! Congratulations on your graduate! Alegria del Mar is a great place for family celebration and glad you had a nice time. We were there for 5 days in May and we saw whales everyday from the backyard. The house is full of personality, clean and pretty much has everything you need. I am planning on going there again! Thank you for sharing your house with us! We are so happy you loved Alegria del Mar and found it clean and inviting. We want you back to the Redwoods as soon as you can get here! Those whales are really fabulous to watch during migration season. They are on their way to Alaska with their newborn calves! Best whale watching is March through June. 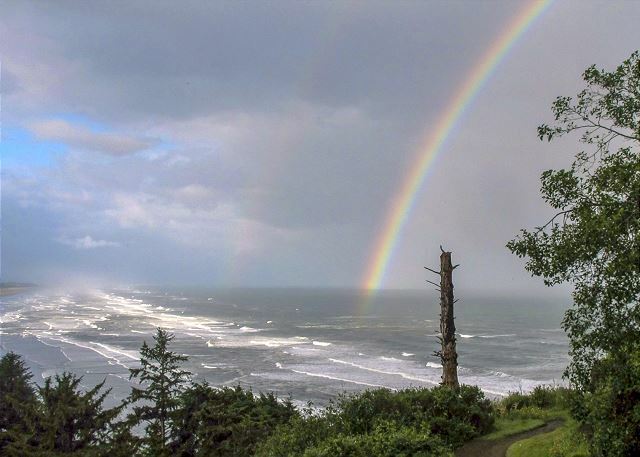 We have many homes with ocean views here at Redwood Coast Vacation Rentals. See you again soon! Alegria del Mar is great! The home was beautiful and the views were awesome. Would love to do it again. We would love to have you again! Thanks for having such a great time! 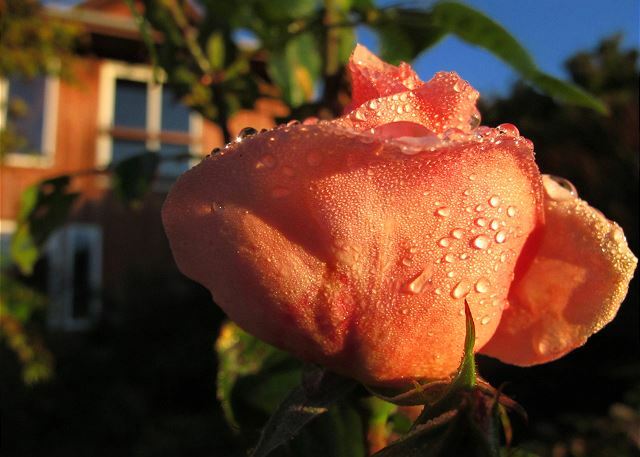 Redwood Coast Vacation Rentals offers 70+ properties on the North Coast, something for everyone! We were a large group filling the house to capacity and everyone agreed it was a wonderful house, lovingly decorated with personal items and with a great view from the main floor of the house. Management was easy to reach (phone numbers posted in obvious places etc), pro-active in contacting us about a local power-out (we were hiking so it did not bother us) and the fact that the oven broke (they even had a partial fix in place by the time we arrived), but we actually never saw them and had the place to ourselves. Some other guests have mentioned a lack of spices so we came prepared and were not lacking for anything in the kitchen. We went out to lunch once to the Lighthouse Grill in Trinidad proper and that was definitely a hit too, good grilled fish sandwiches and refreshing homemade drinks. We loved the house, would rent it again and would definitely recommend it to our friends. Thanks so much for that great review! We really try hard to make the rental experience the best for our guests and consider it lucky when that effort gets noticed. Trinidad area (Redwoods and Beaches) and the Alegria del Mar are extraordinary experiences for anyone. Please come again, and absolutely tell all your friends! This house was a perfect middle ground to be able to visit the Redwoods and the Ocean. The ocean view was amazing and the home was comfortable. We love Alegria del Mar! You summed up the home perfectly in just two sentences. We hope you stay with Redwood Coast Vacation Rentals on your next North Coast trip to explore more Redwoods and Beaches! Thank you! We couldn't have asked for a better location for our Easter weekend getaway. The view is stunning! The 7 of us thoroughly enjoyed seeing several whales! (suggestion: bring binoculars on your trip) We also enjoyed Agate Beach, a hike through Fern Canyon, a day trip to Eureka for lunch and shopping, Big Lagoon, and playing Frisbee on Clam Beach. The house suited the 7 of us (4 adults & 3 teenagers) perfectly; it's cozy, clean, and unique. And the manager provided great customer service when both the coffee pot stopped working and the oven failed to turn off. We had a new coffee pot delivered promptly. The only bummer we experienced was in the kitchen. Future guests need to know ahead of time that if you plan on cooking meals, you must bring all your own spices & oils and I suggest bringing your own non-stick skillets etc. as well. Trying to cook French toast on Easter morning for 7 people was a challenge on the one large-size skillet that is of poor quality. Next time we will bring our own electric fry pan. So glad you had a great Easter and hope you will come again next year. Thanks for your patience with the stove. The part is on order and your husband was correct, we need a new panel. I have sent word to owner to please bring more skillets and restock some basic supplies! Thanks for that feedback and please choose Redwood Coast Vacation Rentals for your next North Coast Vacation! We stayed at Alegria del Mar in March as a base to explore northern California. It was a perfect location to hit the redwoods and beaches with tide pools. In our travels, we saw whales, seals, elk, deer, birds, tidal pool creatures, and the kids' favorite, banana slugs. The house and grounds were spectacular, the pictures don't do it justice. The house was big enough for our family of 5 (with teenagers) to spread out in. The view was unbelievable. The check-in information was helpful and any questions I had were promptly answered via email. If we ever get back to this area of the country, we will hope this home is available. I have already sent a link to this home to 2 friends, so I guess you can say we highly recommend it. Spectacular! We hope you do return to find more wildlife in our great state and national redwood forests. Including the banana slugs! Happy the home was most accommodating and your friends get here soon, too! Algeria Del Mar was even better than we expected! Amazing views and a great place to rejuvenate. We hope to make this a yearly meeting place! Thanks Elaine! The owner custom built this home and is always pleased when others find as much joy as he does at the Alegria del Mar. We absolutely want this to be your yearly meeting place for friends and family. See you again soon! Great location on the cliffs above the seas! Wonderful library and great art. The house was perfect location and was able to get early in and late out time. Glad you loved this beautiful home! Please come stay at Alegria again with Redwood Coast Vacation Rentals or many of our other 60+ properties we have available! The early ins/late outs were a bonus as it worked great with our schedule. We can't do this all the time! Have a great 2015 and hope to see you soon. Gorgeous, well-appointed, and comfortable home with plenty of room for a big family offers much to love. We had a relaxing vacation there while visiting our son at HSU. Beautiful views, but no path to the beach. The home is very personalized by the owner with regards to art/decor, so it has it's own "vibe" going on. Alegria is a great place to stay with great views! Yes, no path to beach. The homes on this strip of the Pacific Ocean are on a bluff giving us those awesome views but beaches are a short 5 min drive or great walk to access. Please visit Alegria Del Mar with Redwood Coast Vacation Rentals or one of our 60+ properties on your next trip to visit your HSU student! While we were placed in this property because of a scheduling conflict, we truly enjoyed our stay. The bottle of wine upon our arrival was much appreciated. The house was very delightful with beautiful wood throughout. The view of the ocean was relaxing. When contacted, the staff was very friendly and helpful. Thanks, John! Couldn't have ended up in a better place for a scheduling conflict! Alegrai del Mar is a great home with great views. Please come stay with us again on your next road trip with Redwood Coast Vacation Rentals!! A small group of students who graduated from college in 1970 get together every few years. We stayed here for 3 days, and enjoyed the house overall. The views are spectacular. However, a number of lights were burned out, and we were never able to locate the binder with information about the house appliances, which was frustrating. The house was spacious and clean, and well appointed. The views were amazing, and the location was convenient. We couldn't get enough of looking at the ocean, both through the windows and from the chairs on the bluff just a few steps from the house. Wish there had been an alarm clock, though. Without great cell service our phone alarm clocks did not work and we nearly missed our flight home. But no worries, a maintenance delay on our plane allowed us to get there in plenty of time. All in all it was a wonderful stay and we're already plotting the chance to stay again! Highly recommend this lovely home for anyone, but especially families. There were 6 adults in our group (one pair unmarried), so the bed arrangements were perfect, and less expensive than 3 hotel rooms. The home is quiet inside, we hardly knew there were other people there. Glad you had a nice time at Alegria del Mar. It truly is an amazing space. I will add an alarm clock per your request, hoping you come again! We spent 10 days at Alegria del Mar. A grey whale was visible eating, diving and relaxing in the bay below the entire time. We saw 3 massive Roosevelt bull elk at nearby Prairie Creek Redwoods Park, Gold Beach and Fern Canyon. The place was magical and comfortable. I saw that grey whale, too! It was so amazing to be able to watch one of nature's most stunning sea creatures right from your garden! And then the Elk, a stunning land creature! What a great ten days you had at Alegria del Mar and what fabulous things you saw! We hope you visit again with Redwood Coast Vacation Rentals and witness more great things! My family and I stayed here when we came to Eureka for my brother's wedding. We had people from Missouri, New Hampshire, Virginia, West Virginia, and North Carolina stay in this home and everyone was comfortable and impressed. The home was in excellent repair, delightfully quirky, and impeccably clean. We especially enjoyed coffee in the mornings and wine in the evenings overlooking the ocean. The garden is perfect (my grandmother said the peach roses were just for her), and the ocean breeze wafting up over the lavender and rosemary is heavenly. We would stay again in a heartbeat! We love it when our esteemed guests have the best time ever and can enjoy the little nuances of each property! Tell your grandma i will always think of her when I take a walk through the yard and see the peach roses in bloom! Thanks again for the great review and hope any and all of you visit our beautiful north coast again with Redwood Coast Vacation Rentals!!! Fabulous view; great house; wonderful vacation! The only suggestion would be to have screens on all the windows - for safety reasons (small children) and keep mosquitos out (we did have a problem with them). We plan to stay again at this lovely house. Glad you had a great vacation at the Alegria Del Mar! The views are fabulous and the home very comfortable. I will find the screens and get them in. Thanks for that reminder. Excellent. My family fit in nicely. Very comfortable. Thanks for enjoying the space! Please bring the family again to Alegria Del Mar with Redwood Coast Vacation Rentals!! Six great friends celebrated "decades birthdays" this year. We wanted to do something special. BOY! Was this special! The house was terrific for relaxing. Some of us sewed, some didn't, but we were all sad to see Saturday arrive. The property managers were Johnny- on - the - spot when we found we needed an iron. They were very helpful. We're looking into next year's journey! Great friends making memories is definitely what we aspire to! Wonderful to hear that the Alegria del Mar was the right match for you all! The proximity to the beach right there on foot is so nice too! Thank you for staying with Redwood Coast Vacation Rentals and hope to have you back for at our Arcata Rentals, Trinidad beach rentals, Victorian Village of Ferndale rentals, our cabins and homes at the Redwood National Park, or even Willow Creek! We loved the house and its location from the moment we stepped in. Lots of nice details, very private, love yard, great view! Thanks for coming to the Alegria Del Mar! It is a fantastic property and glad you loved every minute of it. Please come stay with us at Redwood Coast Vacation Rentals or one of our 50 other properties! Except for the absence of any salt and pepper in the kitchen (we left a box of salt), we were more than pleased with the location, and the house. We enjoyed the chocolate powder. Thanks! Alegria Del Mar is a great place and, yes, that chocolate is wonderful! Please come again to Redwood Coast Vacation Rentals or one of our 50 other properties! Please come againx2000!! Alegria Del Mar is one of our gems with a view here at Redwood Coast Vacation Rentals!! Quiet Retreat with Beautiful Views! We had a wonderful time and were pleased with our overall experience at Alegria Del Mar. Our only hesitation in recommending the house would be that there were a lot of spiders in the downstairs rooms - mostly daddy-long-legs, but if you're afraid of spiders, be aware! Also, I hope that someday the owners add a wrap-around deck. The beautiful views are just lovely from the top floor, but would be spectacular from a deck! We are happy with the views from here too. Will pass the warp around deck info to the home owner. You stay coincided with the spring time spider rush. As the owner likes to keep the home toxic free, he chooses to not fumigate so this will happen occasionally. I put a bottle of natural spider repellent on the downstairs shelf to use as needed. Please come again! The home and location are superb. Our only complaint was the condition of the street leading to the property . It was full of deep potholes that made the street difficult to maneuver. The city needs to repair that street so as not to cause damage to vehicles traveling there. Fortunately the neighborhood agrees with the road conditions and it was just repaired last week. It makes it much easier to drive through but please drive slow! 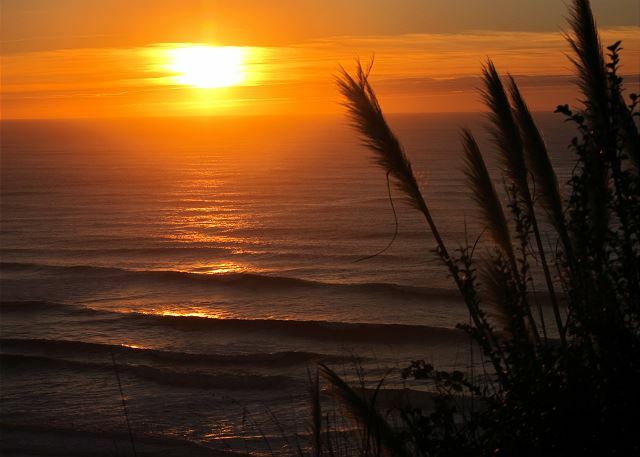 Come visit us again at Redwood Coast Vacation Rentals!! Great location, awesome view, amazing place to stay. 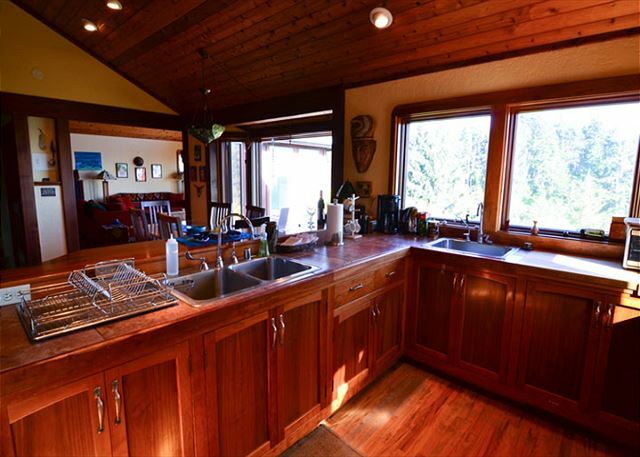 We enjoyed the fireplace, the kitchen, the outstanding views, the close location to great beaches and the Redwoods. Thanks so much. It was just really, really great. Thanks, Thomas! I hope your travels bring you back to Trinidad again someday! Great, spacious house overlooking the ocean close to beaches and redwoods. . Right on! Thank you for staying with us and we were excited to have a famous Pianist Jazz Musician of Jacob Fred Jazz Odyssey with us! We loved your video on You tube and hope that your band will consider doing the music for the videos for our homes! Thank you for staying at the Alegria del Mar & Pura Vida and hope to have you back with us at Redwood Coast Vacation Rentals! You have been staying with us for over 7 years and we really appreciate it! Character, Beauty & Perfect Location all in one! Right on! We are in the great trip business... Thank you for staying at the Alegria del Mar with Redwood Coast Vacation Rentals! Trinidad is halfway between the Bay Area and Portland. It was a perfect location and perfect home to meet family! Lots of comfortable space, views of the ocean and surrounding gardens were wonderful. Thank you Connie and we at Redwood Coast Vacation Rentals hope to see you again. Being the midpoint does make us a great gathering destination. The house is a gem. Warm, inviting, and comfortable with spectacular views. A great location for celebrating Thanksgiving with our family. Thank you so much and hope to see you back at the Alegria del Mar! We loved the view, the garden and the house itself. There could be an improvement on the trundle bed in the upper bedroom --tilted. There should be a microwave oven. Glad you enjoyed the Alegria del Mar. Yes, we were figuring out how to repair the trundle bed. Owner is not a fan of microwaves will work on that. The house exceeded our expectations by far. It was a perfect size for our family of 6. We enjoyed very much making meals and watching the beautiful view of the coast and the redwoods! We were very very satisfied with our stay! That is what we like to hear! The kitchen does have great views at the Alegria del Mar which makes cooking more fun. Really glad to hear! Thank you for choosing us for your 18 hour flight destination! I am so glad we did not disappoint! Really glad it worked well for your diverse family group. We have a futon that we are adding for the 8th person comfortably. 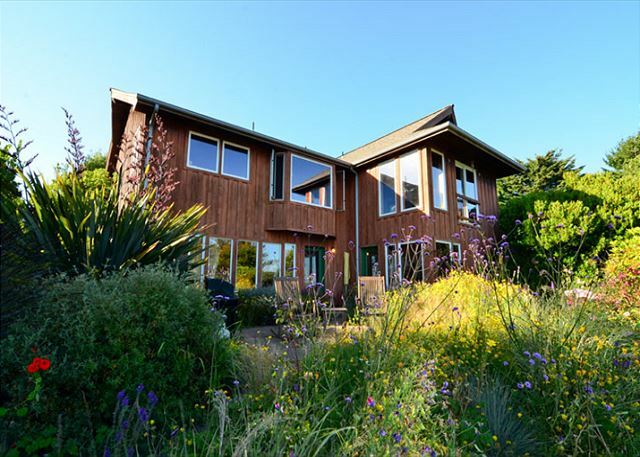 The house is in a perfect location to explore the redwoods and beaches. The grounds and views were fabulous, very relaxing to come home to after a day of sight seeing. Amazing vacation rental with a million dollar view! I rented this home so my family could all be together for my daugthers graduation from Humboldt State. This lovely home enhanced our graduation celebration and made our family time together very memorable. Wonderful to hear! We wish your daughter all the success in the next part of her journey.